Chapter One: Prayer definition. 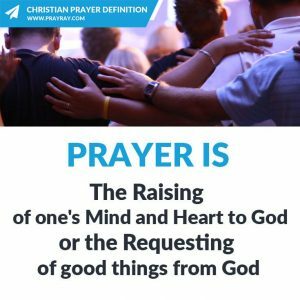 What is Christian Prayer? What is Worship prayer and Praise, Blessing, Petition, Thanksgiving, Intercession? Prayer is a universal impulse. Even non-religious people, in moments of distress, are prone to uttering prayers. But is all prayer the same? Is Christian prayer no different from prayers offered by Buddhists, Muslims, or Jews? And if it is different, then what sets it apart? In short, what makes Christian prayer, Christian? Prayer definition: “Prayer is the raising of one’s mind and heart to God or the requesting of good things from God” (St. John Damascene). Prayer gives us the great privilege of speaking our minds and desires to our Creator. In fact, prayer the only way that we’ve been given to communicate with God. He speaks to us in many ways – through the reading of the Bible, through the preached word, through the sacraments, through the still small voice of the Holy Spirit – but we have only one way to express ourselves to him: prayer. According to the first few chapters of Genesis, God created men and women to have relationship with them. When we first meet Adam and Eve, they are walking in the garden freely with God as their father and friend. But disobedience and sin break the fellowship that God intended to have. This is why God “sent [them] out from the garden of Eden” (Genesis 3:23). Sin hindered our first parents from having an uninterrupted, open relationship with God. Humanity no longer had the privilege of walking with God in the garden. And so, prayer was born. The Bible is the story of God responding to the cries and prayers of individuals. From Abraham’s pleading with God over Sodom and Gomorrah to Stephen’s prayer of forgiveness for the people murdering him, prayer is our only response to the God who made and reigns over us. It’s the single means we have of expressing ourselves to God. What we ask in prayer? But if we’re asking ‘What is prayer?’, we must go beyond this. Prayer isn’t just speaking to God. As the Westminster Shorter Catechism says, prayer is focused on “things agreeable to his will.” In other words, praying for a brand new Corvette‘just because’ isn’t truly Christian prayer. In his first letter, John writes, “if we ask anything according to his will he hears us” (1 John 5:14 ESV). In other words, Christian prayer is prayer that has God and his will as its focus. This doesn’t mean that prayer can never concern ourselves but it must always approach our situation with God at the center of our minds. Christian prayer prays along with Jesus, “not my will, but yours, be done” (Luke 22:42 ESV). But even this doesn’t fully define prayer. In who’s name should we pray? For it to be truly Christian, prayer must be made in the name of Christ. Before being crucified, Jesus told his disciples, “If you ask me anything in my name, I will do it” (John 14:14 ). When he said this, he wasn’t implying that we can get anything we want so long as we tack a “in Jesus’ name, amen,” at the end of our prayers. Praying in Jesus’ name is bigger than that. For ancient believers, a person’s name was more than the sound you made when you wanted to call him. A name represented the essence of the person. It signified his spirit. And so, when Jesus told his disciples to pray in his name, he wanted them to pray with the same attitude – and the same spirit – that he prayed with. This kind of prayer is ordered by the concerns that Jesus revealed through the prayer he gave his disciples in Matthew 6. It’s focused on lifting God up and seeking his kingdom. In its very nature, prayer is a recognition of our fallibleness and God’s greatness. Every time we bow our heads and close our eyes, we’re silently acknowledging that we are not capable of handling things on our own. We’re making it evident that we aren’t self-sufficient and that we need God. If we didn’t, we wouldn’t go to him in prayer. Likewise, prayer quietly recognizes that God is great and has an infinite supply of everything we need. Whenever we pray, we approach the all-sufficient, all-powerful God who is present in every place and time. By bowing my head, wherever I am, I’m making it known – even if only to myself – that I believe God will hear. This is the best answer we can give to the question, ‘What is prayer?’ It’s communication with God that is focused on his will, is done in the name of Jesus, recognizes our weakness, and acknowledges God’s greatness. And yet, all prayer is not the same. Jesus’ prayer in the Garden of Gethsemane is fundamentally different from the prayer that the Isralites prayed when they crossed the Red Sea on dry ground. For every situation of life, there is a proper, prayerful response. Before we go any further, let’s examine some of the types of prayer that we find in the pages of scripture. Worship prayer. Worship happens any time we turn to God and recognize him for who he is. It’s giving him his due and recognizing his worth. And it happens in a variety of ways. We can worship God through song, through service, and through prayer. In fact, prayer has been a vital piece of worship from the very beginning. In the Old Testament, we find Solomon praying to God with the whole congregation of Israel when he dedicated the temple – the very place where worship would take place. And perhaps even more importantly, many of the Psalms were song-prayers used in worship by both the Israelites and later Christians. Many modern Christians have been led to believe that prayer is something we primarily do when we need something or when we have a problem. This is a flawed way of understanding prayer though. Christian prayer isn’t just about getting something. It’s about being changed ourselves. This is one of the best ways to think about prayer as worship. When we pray to God in worship, we don’t seek his hand, we seek his face. Worshipful prayer simply gives God his due by praising him for what he’s done and who he is. What is prayer? It’s worship. Blessing prayer. Throughout the Bible, we come across prayers of blessing. For example, before Jacob died, he gathered his sons around him and he blessed each of them with a prayer. When God led the Israelites out of Egypt, he told Aaron, the priest, to “bless the sons of Israel.” Then, he gave him a famous prayer that has been used by countless Jewish and Christian believers: “The LORD bless you and keep you; the LORD make his face to shine upon you and be gracious to you; the LORD lift up his countenance upon you and give you peace” (Numbers 6:24-26 ESV). These kinds of blessing-prayers are not only common in the Old Testament though. The New Testament is filled with examples of Paul praying for God to bless the various congregations he ministered to. If worship prayers are focused on giving God his due, blessing prayers are focused on asking for God’s blessing to cover the lives of others. What is prayer? It’s blessing. Whereas worshipful prayer is focused on God and prayers of blessing are focused on others, petitionary prayer is the kind of prayer Jesus meant when he encouraged his disciples to pray, “Give us this day our daily bread” (Matthew 6:11 ESV). The reality is, we all have needs. And God desires to meet those needs, whether they’re physical, financial, spiritual, or otherwise. Jesus encouraged his disciples to petition God when they were in need. And both the Old and New Testaments are filled with examples of God’s people bringing God a need. These are legitimate prayers that we should pray. But, if our prayers are ordered as Jesus taught his disciples, we won’t only pray in this way. Our first thought should be for God’s name to be hallowed and for his kingdom to come. Only after we’ve sought God’s face, should we ask for anything from his hand. What is prayer? It’s petition. The Bible is filled with many instances of thanksgiving prayer. Nearly every time God acts, his people respond with prayer. The Israelites give thanks through prayer after they’re delivered from Egypt. The Psalms are filled with prayer-songs of thanksgiving. And Paul opens up nearly every one of his New Testament letters with a thanksgiving for what God has done in the life of his people. Prayers of thanksgiving are exactly what they sound like. They are prayers that we pray in order to give thanks either for what God has done or simply for who he is. These kinds of prayers are a natural outgrowth of a healthy relationship with God. In fact, Paul tells us that we should be able to find something to thank God for no matter our situation. We would be wise to follow Paul’s exhortation to the Thessalonians, “Rejoice always; pray without ceasing; in everything give thanks; for this is God’s will for you in Christ Jesus” (1 Thessalonians 5:16-18 ESV). What is prayer? It’s thanksgiving. One of the best examples of intercessory prayer can be found in Genesis 18:16-33. God tells Abraham that he’s going to destroy the cities of Sodom and Gomorrah because of their great wickedness. When Abraham hears this, his concern over the many citizens of these two cities compel him to intercede. First, he asks God to spare the city if fifty righteous people can be found. God agrees. Then, Abraham asks if he would spare it for the sake of forty-five righteous people. Again, God agrees. Abraham is able to get God down to a mere ten righteous individuals. Abraham’s concern for the people of Sodom and Gomorrah drive him to pray for them. This is intercessory prayer. Moses is another prime example of someone who engaged in regular intercessory prayer, going to God on behalf of his brother and sister, as well as all of Israel (see Numbers 21:7). And we find these same kinds of intercessory prayers in the New Testament. Jesus famously interceded both for his twelve disciples as well as all who would believe through their word in John 17. And Paul often prayed for the believers who were converted through his ministry. When we go to God in prayer on behalf of those who are in need, we are engaging in the much needed, biblical practice of intercessory prayer. What is prayer? It’s intercession. Christian prayer can take many different forms. The Bible describes people praying in a variety of ways and in a number of different positions. Some people prayed while standing, others while kneeling, sitting down, or even lying prostrate. The physical position one is in while praying isn’t what matters. Christian prayer is a spiritual matter, not a physical one. However, there are three different spiritual levels of prayer that are worth considering. The most common kind of prayer is the vocal prayer. These are the prayers that we pray when we audibly speak or sing words to God. For example, when we follow Jesus’ example and pray the Lord’s Prayer, we are engaging in vocal prayer. The same is true if we were to sing a psalm prayerfully or even if we simply prayed whatever came to our mind. This is the kind of prayer that we normally think of as ‘prayer.’ But not all prayer is vocal. The Old Testament includes example after example of individuals meditating on God and his word. The Psalmist writes, “My soul will be satisfied as with fat and rich food, and my mouth will praise you with joyful lips, when I remember you upon my bed, and meditate on you in the watches of the night” (Psalm 63:5-6 ESV). But this kind of meditation shouldn’t be confused with eastern or transcendental meditation. Christian meditation involves reflecting on and pondering God and his word. In fact, the Hebrew word for meditation meant to ‘mutter’ because that is what someone actually did. He would mutter to himself and reflect on who God is and what he’s done. This kind of prayer is valuable when we’re less interested in getting something from God and more interested in hearing God’s voice. In meditation, God often speaks to us through his still small voice, answering questions and giving guidance. In vocal prayer we express our thoughts to God. In meditative prayer, we listen for his voice. And in contemplative prayer, we simply seek his presence. Once we’ve come to understand these things about Christian prayer, we’ve begun to answer the question, ‘What is prayer?’ And yet, it is truly only the beginning. Elwell, W. A., & Beitzel, B. J. (1988). Prayer. In Baker encyclopedia of the Bible (Vol. 2, p. 1745). Grand Rapids, MI: Baker Book House.